The stunning sequel to Throne of Glass. 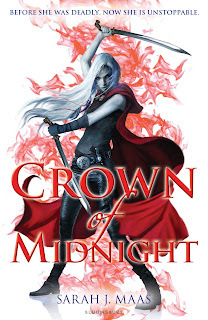 Crown of Midnight was an action-packed, fast-paced and expertly-plotted sequel that will leave readers gasping for breath one moment and with tears pouring down their face the next. It not only will leave you wanting more, it will make you want to be a part of the vivid world Maas has created. I loved book one, and had no idea how Maas would be able to improve for the sequel, but her writing blew me away. As for Celaena Sardothien, Adarlan's Assassin and now the King's Champion, you got to have a more in-depth understanding of her character. From hunting down traitors of the Adarlan's throne for the King, to her love for chocolate cake, Celaena just grows throughout this novel. Yes, she's still arrogant and flirtatious, still walks with undeniable swagger in her steps but you also see her fall in love and deliberate how people feel towards her. While Celaena yields Damaris, the sacred sword that belonged to the first King of Adarlan, as her weapon, Maas' is clearly words. When I opened the first page of Crown of Midnight, I became completely engrossed into the world she had created once again. So in-grossed in fact, I hardly put this book down until I had finished reading it. The plotting was just incredible as well as the understanding of the world and it's history. There's an effortless quality of being able to trick the reader, in a way where a plot twist is thrown at you when you're least expecting it. Just like Celaena's victims, as a fair share of blood is spilled during the novel, you never see it coming. The writing is elegant, beautiful and descriptive - I can't believe I'm saying this is even stronger than that in Throne of Glass. Plot-wise, as Celaena can't bare to kill for the crown, she is putting those who she loves at risk. As Celaena continues to fake deaths, knowing the King could find out at any moment, she leans that there is something even deadlier taking place in the Castle. Once again, it is left to Celaena to discover what it is and try to solve it, which allows the tension to build as she learns more. As for the characters, there was this perfect contrast of good-and-bad, the heroes and the villains. Celaena does clearly favour one man in particular during this novel, and the romance for me was breath-taking. Chaol and Dorian's friendship was something I learnt a lot more about, as well as where their loyalties lie. Nehemia: the kind-hearted Ellylle Princess and Celaena's closet friend, was continuing to fight for the slaves in Calaculla while someone plots against her. There's also a talking door-knob and a witch with iron teeth - what more could you want from a sequel? The only comment I could make in a negative way would be the fact, with so much going on, at the end I became confused. I did in a way feel like I had missed something but, when you tie it all together, the next book is going to be ground-breaking! Words can't describe how much I loved this - you should read it for yourself to find out. Immediately! know more about the characters they fell in love with in book one. For the record - I'm shocked I got through this review without using Caps lock! Amazing review, Sophie! I have an ARC of this but haven't read it yet :/ Glad you liked it! Thank you so much, Amber! Ahhh - you need to read it! I need someone to discuss it with. It's amazing! Thank you! I'm so glad too, I had no idea how Sarah J. Maas would be able to follow up such an amazing first book! Haha, same here! One day...! Thank you! Have you read it yet? Yay! What did you think? It's one of my favourite books and I'm so, so glad you finally picked it up! Thank you, Sunny! I hope you like the sequel just as much - it definitely has it's surprises. And Celaena is ten times more feisty, arrogant yet caring in this one!